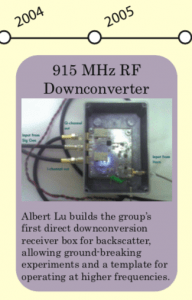 915 MHz RF Downconverter: Albert Lu builds the group’s first direct downconversion receiver box for backscatter, allowing ground-breaking experiments and a template for operating at higher frequencies. This direct downconversion hardware at 915 MHz produced a filtered baseband IQ receiver output that enabled the first round of serious backscatter modulation experiments by the group. Deigned by Albert Lu, it was a prelude to the microwave hardware that would constitute the 5.8 GHz backscatter system. Fun Fact: Albert Lu built a lot of RF hardware that was later featured in the group’s 2005 NSF CAREER proposal on microwave backscatter. The gist of that successful proposal effort was to build microwave versions of the devices that lab members had “proofed” at 915 MHz.